The eruption of Mt. Vesuvius must be at the top of the list of phenomenal natural events of the first century — if not all time. That eyewitness was Pliny the Younger, who was not yet 20 years old at the time of the eruption. He was living with his uncle, Pliny the Elder, in Misenum at the time. Misenum is north of Vesuvius along the coast of Italy and escaped much of the destruction of the mountain because the lava flows and blackening clouds headed south for the most part. There were people, too, who added to the real perils by inventing fictitious dangers: some reported that part of Misenum had collapsed or another part was on fire, and though their tales were false they found others to believe them. A gleam of light returned, but we took this to be a warning of the approaching flames rather than daylight. However, the flames remained some distance off; then darkness came on once more and ashes began to fall again, this time in heavy showers. We rose from time to time and shook them off, otherwise we should have been buried and crushed beneath their weight. I could boast that not a groan or cry of fear escaped me in these perils, but I admit that I derived some poor consolation in my mortal lot from the belief that the whole world was dying with me and I with it. The eruption, and its ensuing tragedies, became much more personal in the days ahead. Pliny’s uncle, Pliny the Elder, was a Roman official in Misenum. He received a call for rescue from someone he knew in Stabiae, and he immediately put together a small fleet and sailed south past the volcano. It wasn’t long before the ships ran into a cloud of dust and ash. For a moment my uncle wondered whether to turn back, but when the helmsman advised this he refused, telling him that Fortune stood by the courageous and they must make for Pomponianus at Stabiae. He was cut off there by the breadth of the bay (for the shore gradually curves round a basin filled by the sea) so that he was not as yet in danger, though it was clear that this would come nearer as it spread. Pomponianus had therefore already put his belongings on board ship, intending to escape if the contrary wind fell. This wind was of course full in my uncle’s favour, and he was able to bring his ship in. He embraced his terrified friend, cheered and encouraged him, and thinking he could calm his fears by showing his own composure, gave orders that he was to be carried to the bathroom. After his bath he lay down and dined; he was quite cheerful, or at any rate he pretended he was, which was no less courageous. Meanwhile on Mount Vesuvius broad sheets of fire and leaping flames blazed at several points, their bright glare emphasized by the darkness of night. My uncle tried to allay the fears of his companions by repeatedly declaring that these were nothing but bonfires left by the peasants in their terror, or else empty houses on fire in the districts they had abandoned. Then he went to rest and certainly slept, for as he was a stout man his breathing was rather loud and heavy and could be heard by people coming and going outside his door. By this time the courtyard giving access to his room was full of ashes mixed with pumice stones, so that its level had risen, and if he had stayed in the room any longer he would never have got out. He was wakened, came out and joined Pomponianus and the rest of the household who had sat up all night. Ultimately, the party determined that they could not stay where they were. Pliny the Younger did not accompany his uncle on the rescue mission and could only have gained this detailed description by interviewing those who returned. “The Destruction of Pompeii, 79 AD,” EyeWitness to History, www.eyewitnesstohistory.com (1999). 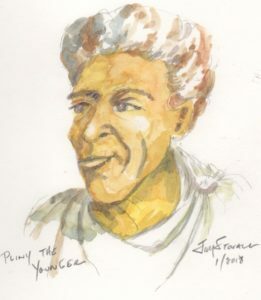 See the previous post on JPROF.com about Pliny the Younger: Roman’s top-notch reporter.